Movie Ticket Pricing Strategy: Should all movies cost the same? As you can see from the examples above, ticket prices of much-awaited festive releases like PK, Happy New Year and Kick are on the higher side – which is fair, because they are the most-awaited movies of the year featuring the biggest stars in the country. But tickets for all other films are priced the same. 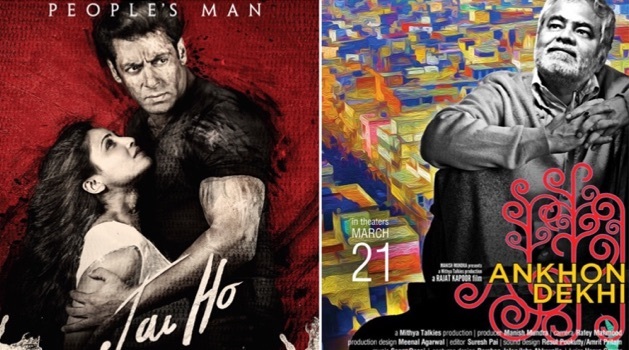 Which brings us to the big question – Would the audience be willing to buy the tickets of Ugly and Aankhon Dekhi at the same price as Special 26 or Jai Ho – both of which have a much bigger star cast and budget? If not, wouldn’t it make sense to keep the prices of smaller budget movies a little lower, to attract more audience and thereby increase the opening day occupancy? Multiplex tickets of Salman Khan’s Jai Ho and Rajat Kapoor’s Aankhon Dekhi cost the same! Is it fair? We have all studied about the co-relation between price and demand. When the price increases the demand may suffer, i.e in case of movies, if the ticket prices are too high, fewer people will be inclined to go watch a film in theatre. At the same time, if tickets are priced too low, it could affect the business of a film. Today the number of movies that release every week has increased considerably, if earlier there was one movie every week, now we see at least 2 movies releasing every week apart from all the Hollywood and regional releases. Can the audience afford to watch a movie every week or at least one movie every two weeks? Various movies which are critically appreciated, take for instance films like Aankhon Dekhi, Zed Plus, Suleimaani Keeda do not find many takers. At the end of every year there are various films being deemed as under-performers, even though content-wise they deserved to be successful. We always grieve about films that find ‘4-star ratings’ in the tabloids, but fail to even recover their release costs. There may be many factors related to their under-performance for instance the lack of face-value (films without stars), lack of good music or bad marketing. However, the trade continues to strongly believe that there is always a chance for a movie to pick up, as WOM (Word of Mouth) remains the most powerful marketing tool that exists. But without a decent opening, even good word-of-mouth may not be enough as exhibitors may reduce / cancel shows due to extremely poor occupancy in the opening weekend. So what is the solution for smaller films to take a fairly good opening – so that they at least have a chance to sustain over the weekdays and finish as reasonably good grossers? We think the pricing of tickets could be the biggest culprit here and we think we have a solution to this. There could be a certification for each and every film that releases. Just like a censor certificate, there should be a category certification to classify films into holiday / festive, non-holiday and concept / low budget films with no face value. We divide all films in 3 categories- A, B and C.
Take the case study of pricing in only one theatre for explanation. Our standard theatre will be PVR for analysis. Generalised templates that should be setup for all films that would help benefit both exhibitors, distributors and as well motivate people to come to the theatres. The most premium rates are charged when an ‘A list film’ releases on a festival. People do not mind paying that extra buck since these festivals are generally a boost for families in terms of income. Also like in case of PK – Christmas and Eid – Kick, people know a Salman film or Aamir film comes once a year hence they do not mind the extra money. These are the films that we would categorise as exciting however the scaling and anticipation of these films may not be of an ‘A list’ film. Hence the ticket prices could be a little lower than films featuring A-list actors. A theatre of 350 occupancy which has sold 120 tickets at 150 – Revenue 18000 – But more people watching the movie hence more interaction which may lead to better WOM. Added benefits of more footfalls is more sales of food, drinks etc which will ensure higher revenue for cinema owners. We feel ‘Instance 2’ is more beneficial to such films. Also, keeping ticket prices low for such films may encourage people to come to watch the theatres as they do not mind spending Rs 150 per ticket on experimenting but may hesitate on spending 250-300 on the same film. It may also discourage piracy as a person may now enjoy an affordable large screen experience. Economies of large scale will definitely help such films attain longevity. Categorise wise differentiation of films will definitely help all kinds of films to survive. It’s near foolishness to ask a consumer to pay almost the same rate for the first day first show of a Shahrukh Khan or Akshay Kumar film and a Rajat Kapoor film. There might be aspects of this that might need more research and a bit of tweaking, however, do share your thoughts on our observation and analysis. I agree with Indicine that bigger films can be sold at higher ticket prices but films starring debutants,flop actors or character role actors should b sold at 30-40% lower ticket prices to ensure a more respectable opening for them so that if wom is gd they cn grow over the week. But I don’t agree how Indicine has put all young actors in ‘B category’ and is happy with our hits being sold at lesser ticket price than an Akki or Ajay film. Even in case of big films the ticket prices shouldn’t be sky high.Tickets were being sold at Rs.950 at the nearby PVR for gold class in Bangalore for Pk which isn’t acceptable.Even the minimum ticket prices were around 200 for morning shows in the weekend which prevents the die hard fans of actors to watch their favorite star’s movie on the first day. As you have mentioned he ticket prices for smaller films need to be reduced if the producers want to recover their costs apart from getting rave reviews. very nice article @indicine.. jai ho collected 110 cr despite less ticket price, which I considered as very good collection.. if Jai Ho ticket prices were on the same level of Kick n HNY, maybe movie would have crossed 150 cr..
Indicine is still harping over ticket prices,give it a rest already. In America people is spending 3% of their income to movies per month… But in our country most of the people spending 30% of their income to movies per month…… 550 rs is very over…. 150 is crct rate… @indicine why u missed ranbir in A list category? I think there is no need to increase ticket prices 3 times every year on eid,diwali and Xmas.. Ticket prices should increase every year on Eid and that should carry for Diwali and Xmas too and the rules should be strict so that no actor/producer hike it more than that. One of the best articles I have read on bollywood sites. Thanks indicine for giving akki and ajay the respect they deserve. it doesn’t mean they are not superstars if they allow their more famous khans and hro to take the holidays, that because they respect [email protected] kapoor fan please don’t compare them with your kids. They are still lead actors after 20 plus years let us how your arjun kapoor survive even for ten years in this industry. Interesting article …tickets should be priced according to what it costs to show that movie, divided by how many tickets you sell, plus a profit of course. So for example if it costs $1,000 to run a screening of PK and you expect to get 100 people in your cinema, then $10 a ticket is break even. You need to charge more than that to make profit. However if it costs the exact same $1,000 to run a screening of a less popular movie, then you obviously need to charge way more per ticket to make a profit. Since people are never going to pay more to see a less popular movie, cinemas are of course left to charge the same fee across the board, with enough markup to make up for the screenings that run at a loss. @Idiot sambudha: Read the article again.. These are just the suggestions to set up a pricing strategy by citing examples.It is not what has happened. Ticket prices of 2 states,Ek villain,Holiday,SR were all the same!! Plz it is enough of you to get degrade akki/ajay. @akkil lokhande aka ARJUN KAPOOR FAN: So once again you have started creating fake ids..you literally leave no stone unturned to bash akki!! and when that dynamic creates your fake ids then cry like hell..
have u gone mad? Akki is established superstar of bollywood. Don’t compare akki with flop actor Arjun kapoor. Your Arjun kapoor always is a side role supporting actor.Siddharth is one of the worst expresionless actor in industry.Ajay devgan and akki are senior pros in industry. Tevar is a disgrace due to flop actor ARJUN and baby will be first hit of 2015. I believe Ranbir should be placed in the ‘A’ category, he is a huge crowd puller already, I watched YJHD at a high end multiplex for 400 bucks, I won’t do the same for an Ajay Devgn or an Akshay Kumar film, & just like me, majority of people atleast in Cities would prefer a Ranbir movie over a Devgn/Akki movie. A List – KHANS, Hrithik, Ranbir. B List – Devgn, Akki, Saif, John, Sidharth, Ranveer, Varun etc. C List – other low budget movies. also at high end multiplexes, the night shows are much more costlier than 550 for big films. Its really graet article…..but this is exploitation of customers charging 950 rs since u knw….customer want to see movie anyhow……ur analysis is best in point of view of producer. ..but as a customer it is exploitation. ..it is ethically wrong…..
@zeeshan worry for ur fading actor srk whose fan /raees lifetime is jaaga jasoos 1st week. Don’t worry for akki. Akki’s 4 films look perfect and will collect more than fan/raees. @ARJUN KAPOOR i think god forgot to give you mind . akshay is among the most popular and established superstar of bollywood. newcomers can never come close to him and specially your arjun kapoor , he cant even dream to get as much popularity as akshay and ajay have. his mindless masala is coming nobody is going to taste it.